Dior’s legacy has been captured. 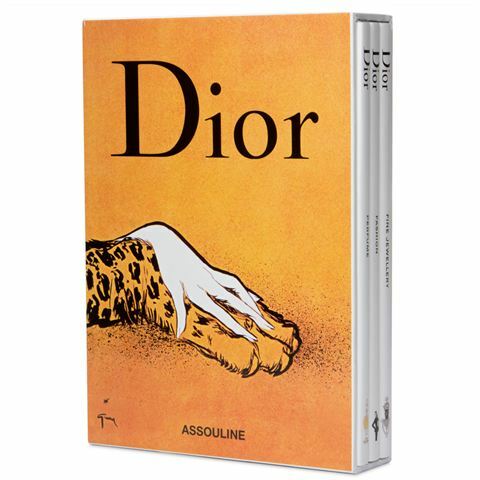 This collection of three books showcases the incredible design influence of Christian Dior throughout history and it will capture your imagination. Presented in a stunning Dior box, this set will look beautiful on your bookshelf or coffee table. The three books included in this set are Fine Jewellery, Perfume and Fashion. Fine Jewellery displays Dior’s fabulous jewellery designs, Fashion showcases his magnificent success in haute couture and Perfume celebrates his incredible influence on the world of fragrance. Each book begins with a short history of the House of Dior, introducing glossy pages of colour photography to follow. Let the imagination and luxury of Dior into your home. Set of three eighty-page hardcover books – Fine Jewellery, Perfume and Fashion. Presented in a Dior display box. Set Dimensions: 16.5 x 23 x 4.5cm. Individual Book Dimensions: 16.5 x 22.5 x 1cm.